In just 30 days you will learn posture, exercises, 4 chords and play a whole song: How Great is Our God. Just $10 to do the challenge and you get a $29 coupon if you complete the whole thing! 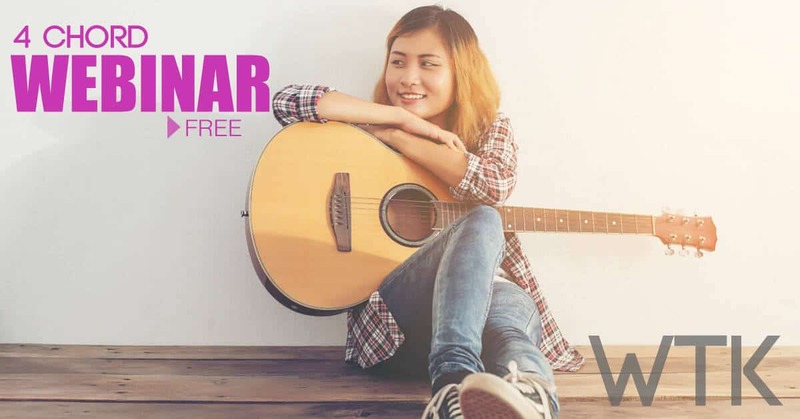 Free 4 Chord Webinar – Get Instant Access Now! This is the best 22 min webinar I’ve ever made and it will put you on the fast track! I’m going to show you the 4 chords every guitar player should learn FIRST and use the MOST! First, I’ll teach you how to easily form these 4 modern worship chords and then I’ll show you the tricks that the pros use to make them sound awesome. You will see how keeping your pinkie down between chord changes will speed up your changes and I’ll show you how to use less fingers and have better sounding chords. We will end by strumming a few simple worship songs with these new chords and you will be able to download the chord charts to keep and print them out! Free WTK Chord Chart – CLICK TO GET CHARTS! All my favorite chords and charts on one printable page! Enter to Win a guitar every month! – Learn More!